The 1955 NCAA Men's Division I Basketball Tournament involved 24 schools playing in single-elimination play to determine the national champion of men's NCAA Division I college basketball. 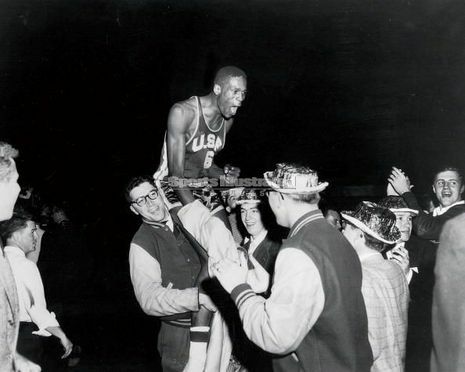 It began on March 8, 1955, and ended with the championship game on March 19 in Kansas City, Missouri. A total of 28 games were played, including a third place game in each region and a national third place game. San Francisco, coached by Phil Woolpert, won the national title with a 77-63 victory in the final game over La Salle, coached by Ken Loeffler. Bill Russell of San Francisco was named the tournament's Most Outstanding Player. Led by guard K.C. Jones and center Bill Russell, the Dons edged PCC champ Oregon State, 57–56, in the West Regional final at Corvallis, Ore., then went on to meet Tom Gola and defending champion La Salle in the NCAA championship game in Kansas City. In a surprise move, USF coach Phil Woolpert assigned the 6-1 Jones to cover the 6-7 Gola and K.C. outscored UPI's first Player of the Year, 24–16. Russell, meanwhile, scored 23 and pulled down 25 rebounds as the Dons beat the third-ranked Explorers easily, 77–63, to end the year at 28–1.